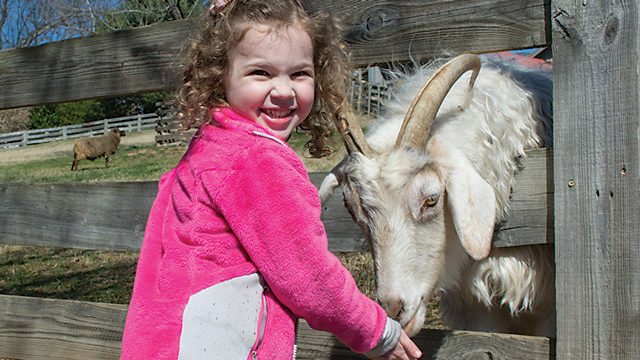 The Farm at Maymont, which was closed for a year of renovation, reopened last month with a renovated barn as well as the addition of new play areas, outdoor paddocks, and new classrooms for programs and birthday parties. A rain garden and a bio-retention area were also added to foster and promote environmental sustainability. The large variety of animals now at the Farm didn’t inhabit the grounds when James Henry Dooley and his wife Sallie May bequeathed their 100-acre Victorian country estate to the city in 1925, stating that it was to be used as a museum and park. The animals the couple did own were prize-winning horses, chickens, and cows. The city opened Maymont to the public in March 1926. The urban treasure didn’t feature animals until the late 1950s when Thalhimer’s great grandfather, William B. Thalhimer Sr., brought over the animals that Thalhimer’s store used in its advertising campaign. 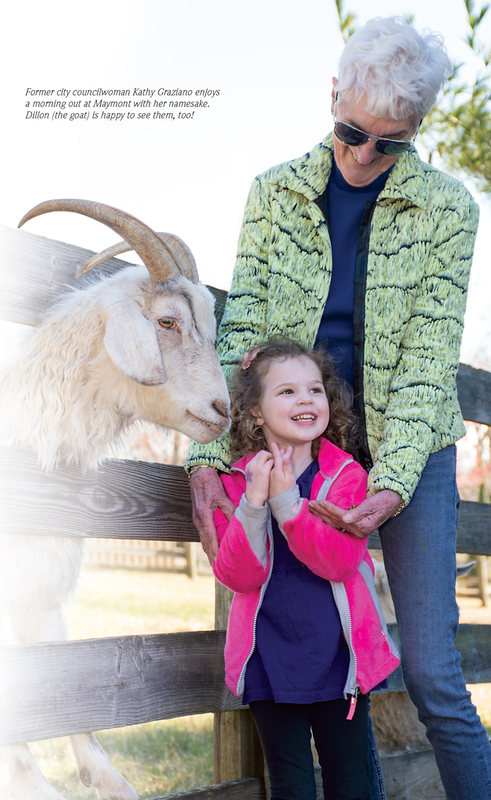 The park created animal exhibits in 1959 and completed the Farm in 1960. Giving kids the opportunity to enjoy Maymont and its animals in the same way Thalhimer did years ago is rewarding for him, as is the fact that his teenage children, Will and Claire, volunteer at the Robins Nature and Visitor Center. “They love the Japanese Garden at Maymont and the Farm. They also love the history behind it,” he says. 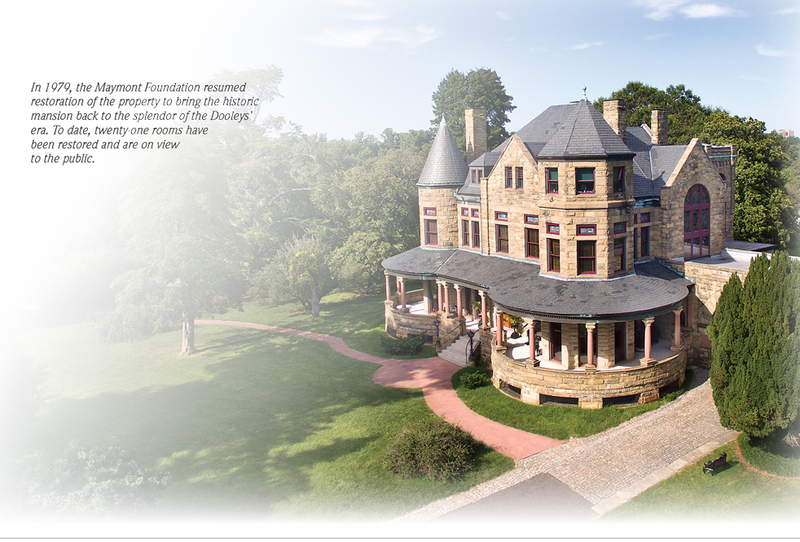 In 1975, the Maymont Foundation began overseeing the property and resumed restoration to bring it back to the splendor of the Dooleys’ time. To date, twenty-one rooms have been restored and are on view to the public. The original barn and pastures were completed in 1960 before the Foundation’s involvement. The site was relocated in 1983 to accommodate larger facilities for the animals in a location that was more accessible for guests who wanted to pet the animals. For former city councilwoman Kathy Graziano, the animals at the Farm were a definite lure for her and her nine grandchildren – six are under the age of fourteen. She has been visiting Maymont since she moved to Richmond from New York City in 1969. “I always brought my four kids, and by the time I got through with mine, the new crew of grandkids was coming along,” she says. 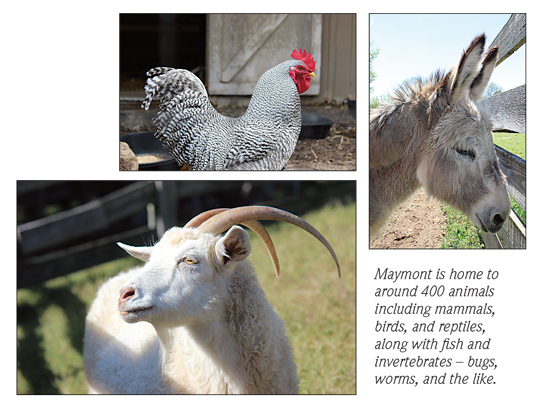 Today, Maymont has around 400 animals that include fish and invertebrates (bugs, worms, etc. ), along with mammals, birds, and reptiles. 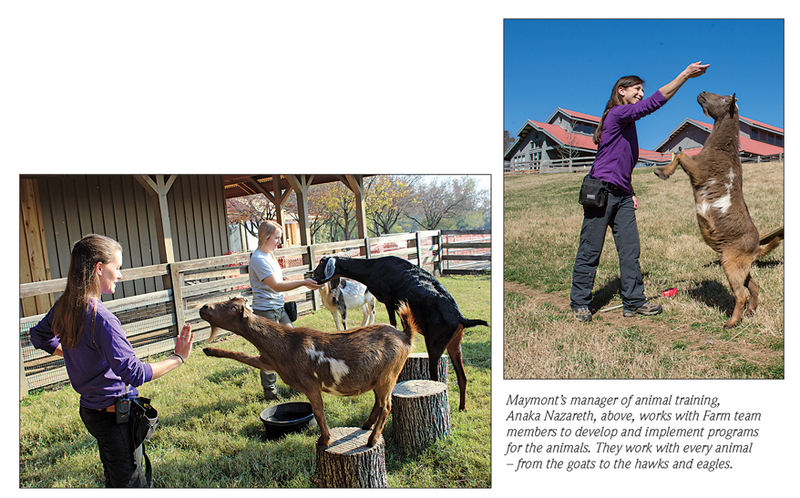 Anaka Nazareth, Maymont’s manager of animal training, spends her days developing and implementing training programs for the animals. “A big part of my job is teaching the staff how to train the animals,” says Nazareth, who has a bachelor’s degree in exotic animal training and management as well as a master’s degree in animal behavior and conservation. She and the staff train every animal from the bobcat and the bears to the spotted deer and the chickens. “We also work with birds of prey, such as the hawks and eagles, and in the nature center, we work with flying squirrels, turtles, and alligators,” she says. The goats are very eager learners so Nazareth and her staff have to slow them down when they are in training. “They are very food-motivated, and they love the grain we train them with,” she says. There are some additions to Maymont’s animal population this year. The Farm is getting new adult Blackface sheep, and perhaps some new arrivals of the slightly more adorable kind. “Some of our goats are out for breeding so we could potentially have some kids (baby goats),” she says. That love and respect for the animals that inhabit the Farm shines through for Graziano, and she appreciates it – especially when she visits Maymont with her younger grandkids in tow. Next articleWhen the Giving is Girl-Powered!